Masahiro Tanaka turned 25 on Nov. 1. Release the hounds … or the wallets. The Rakuten Golden Eagles have decided to post right-hander Masahiro Tanaka, the hottest pitcher on the free-agent market, Jon Paul Morosi reported Tuesday night. All major league teams that bid the new $20 million limit will earn the right to negotiate with the 25-year-old Japanese ace, who was 24-0 with a 1.27 ERA last season with the Eagles. 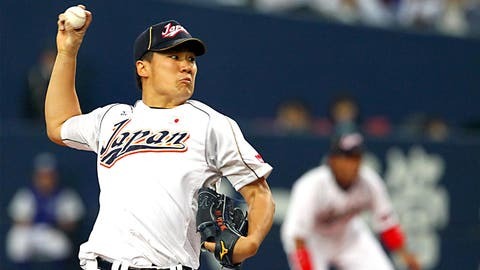 Tanaka, who won the 2007 Pacific League Rookie of the Year, is 99-35 with a 2.30 ERA in his professional career. But, let’s face it, the only teams that will have a chance at signing Tanaka will be big-market clubs. You hear the Dodgers, Yankees, Rangers, Cubs and Angels are among the interested, but no word if the Royals, Reds or Rays are. Is this really fair? No wonder people love to hate the Dodgers and Yankees. Nothing against Tanaka, but it would be enjoyable if some team wins the bidding war and pays him a ridiculous amount of cash and he turns out be no better than Justin Germano. At least once this Tanaka deal gets done — or out of the way — the bidding can begin on free-agent pitchers with major league experience (see Ervin Santana, Matt Garza and Ubaldo Jimenez).